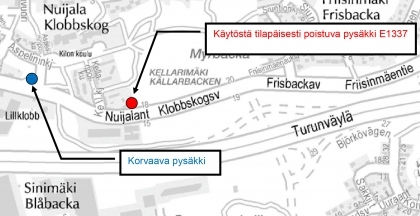 The "Kellarikuja" bus stop E1337 on Nuijalantie will be closed from 28 October to 27 November due to constrution work. The closest stop is "Nuijamäki" E1864 at the Aspelininkuja intersection. The stop is served by routes 203, 206 and 543.